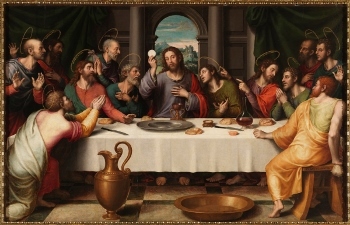 It is powerful for us to be part of the story on the actual night of the Last Supper, the night that Jesus instituted Communion. It is important for the children to know that they are part of this story and they need to know that they belong at the table with all of us on this special night. This is the essence of our faith. The service begins with dinner in Hadley Hall as we all participate in the story of the Last Supper and a communal celebration of Holy Communion. We will eat and celebrate together around tables in the same way that Jesus did with his disciples over 2000 years ago. The service continues in the Church where we remember that this is also the night Jesus commanded us to love one another and to serve each other. Maundy means command. Jesus demonstrated what it meant to love one other by washing his disciples’ feet. We participate in this story by washing each other’s feet. This is a special service for all ages. Please plan on coming.